After years of toil, Eddie's gotten his toe on the housing ladder. No more miserably living in house-shares with antisocial weirdos. No more throwing his wages into a landlord's bottomless pockets. No more worrying about whether his tenancy will be pulled out from under him like the proverbial rug. He's even got a lovey-dovey new girlfriend, Anya, who he's impulsively decided to ask to move in with him. As his Dad puts it: "you've got the whole set now." What the hell is going on? What transpires is a gently magical realist ghost story that deals with grief, the concept of 'home', ownership of property and the dangers of swaddling yourself in memory. Turf is a well-observed, smart little play riddled with tiny observations that'll chime for most Londoners. If you're aged between 20 and 35, your chances of owning your own place are miniscule. As it stands, the only way out of the rental trap is either draining the finances of relatives to be able to afford a deposit, lucking into some elite finance job that pays £100k a year or, I dunno, winning the lottery. Running through the play is the assertion that a human being should have a place to call home. We feel Eddie's pain as he describes cramming himself into some dingy flat-share as he scrapes together a deposit, or (in an evocative bit of writing) explaining how he craves space after living in a city that tends to squeeze people together like sardines. When he cries that he deserves a home, he's right. Then again, Anya is also right. Doing my best to skim over spoilers as best I can, she counters Eddie's financial claim to the property with an emotional one, spelunking deep into her memory caverns as she struggles to process the death of her mother, her estrangement from her extended family and the loss her of livelihood. Playwright Margaret Perry provides a smörgåsbord of intellectual gristle to chew on: correctly identifying and underlining the worries of young Londoners. Turf is a great text. Unfortunately, this particular production of it has a number of deficiencies that prevent it from being a great play. First and foremost is underwhelming stage design. The surreal conceit is that Eddie's home is under invasion from plant life, though this is conveyed by chucking a few sprigs of ivy around the stage, putting some flowers in a vase and eventually revealing a fake grass rug. I get that this is a fringe production, presumably with the usual budgetary and time constraints, but what's on stage simply doesn't feel like an unstoppable invasion of greenery. Next are a few performances of variable quality. Karen McCaffrey as Anya's dead Mum is the best of the bunch, conveying a cool, green-fingered serenity from beyond the grave. We're left wondering whether she's an actual ghost or a hallucination of Anya's, and McCaffrey's performance accommodates both ends of the spectrum. Laura Harding's Anya is almost as good: wiry, faintly strung-out and able to shift from cosy domesticity to a thousand-yard stare of pain almost instantly. The best moments of Turf come as the two interact, Anya growing slowly cosy with her ghost-mum as she sinks deeper into delusion. It's in Royce Cronin's Eddie where the play really comes a cropper. To be blunt, he's wooden as all hell. His performance is limited to three 'gears': calm, peeved and furious, and he cycles between them without any gradients. 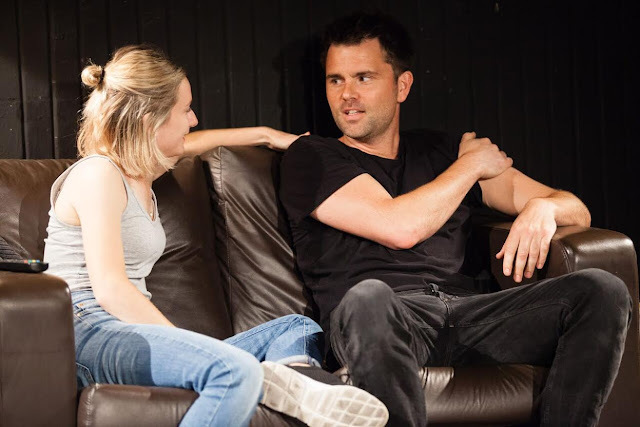 The play is written as a fairly evenly balanced conflict between Eddie's pragmatism and Anya's sentimentality, so it's hobbled when one side of the equation simply doesn't convince. Still, Turf is a play stuffed full of great ideas and big bundles of promise. With a bit more theatrical oomph and some performance re-tuning it'll be something special. Turf is at the King's Head Theatre until 30 July. Tickets here.